Leading firms are using best-of-breed software to source relevant data for their clients, auto-process it and then analyse and report on the data to provide meaningful insights. This approach allows you to keep up with the pace of modern business, move from being reactive, and provides a strong foundation for value based services. Our keynote presentation and many of our conversations at AVN’s The Cloud Conference earlier this month focussed on this exciting new trend. The Cloud Conference itself had a theme of accountants harnessing the latest technology to save more time, win more clients and earn more money. It was fantastic to see so many accountants interesting in utilising different cloud technology products together, to be able to deeply understand their client’s businesses and provide meaningful insights and advice. 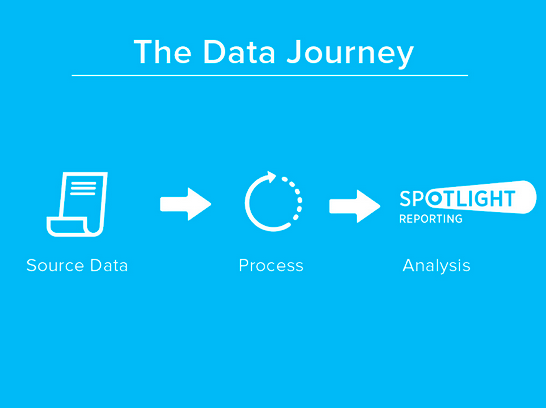 Broken down into stages, our presentation looked at what products you could use to source the data pertinent to clients, process it, and then finally to surface useful analysis. There are a variety of data sources available to your clients and your firm also. There are sources that will be useful to a majority of your clients, ones that will be applicable to particular types of clients (due to their industry specialisations), and also ones specifically for your own accounting firm. The majority of your clients will be familiar with the hassle of collating receipts to support expenses incurred. The data entry involved in capturing this vital information is time-consuming and resource-intensive. Receipt Bank solves this problem. The beauty of using Receipt Bank is it extracts all of the relevant data from your receipts, removing the need for them to be manually entered. You can then upload or publish this data into your accounting or bookkeeping software for it to process. This ensures your client has accurate and up to date data, while dramatically reducing the administration time normally involved. If your accounting firm specialises in dealing with a particular industry or you have clients in a few different industries, you might like to look at solutions that source the particular data relevant to them. If you have any retail clients you might like to look at Vend which is point-of-sale, inventory, and customer loyalty software. If you have any service or consultancy based clients, all the data relating to the management of their jobs can be captured through WorkflowMax. Anything from time tracking against projects and jobs, to notifications on delays on project deadlines, job profit margin and who your biggest clients are, is all data captured by WorkflowMax. With this source data feeding into your cloud accounting software, the financial data can be processed and you can have a real time view of business cash flow. Businesses can control their cash flow and make better decisions, with the right data being processed and you as an accounting professional always seeing up-to-date financial information. With the collaboration cloud accounting software provides as well between you and your client, a two way dialogue has been opened up and you can more efficiently be of help to your client when needed. With all sourced financial data being fed into and processed in one place, you can ensure there are no nasty surprises. Having the capability to examine the financial position of each one of your clients on a needs basis, rather than at durated intervals, means that you are able to add value and insight to each business and help them perform better today. Analysing not only the financial data that has been fed into the cloud accounting software, but also the non financial data for your client together allows you to provide a holistic overview for the client’s business and advise proactively. With Spotlight Reporting not only can you report on your client’s financial performance, position, and cash, you can measure this against non financial KPI’s and other sourced data that’s pertinent to your client’s business. Spotlight Reporting has integrations with key accounting platforms, WorkflowMax, EXCEL, Vend (coming soon) and even with Google Analytics. So if you have any clients with websites, you can analyse data on their website performance and leads through their sources, unique visits, locations of those visits, their bounce rate and so on. With the illustrations of different potential sources above, you can import data from those different solutions and report and analysis those key metrics as well. Take a retail client for example, you could report and analyse their highest sold products, best performing staff member and or store, shop sales vs online sales, highest performing month, staff salaries vs profit, debtor and creditor days and so on. This comprehensive analysis provides you the platform for value based services and moves you to being a proactive advisor for your clients. Additionally, you can choose, template and narrate the report and analysis so it’s personalised for each client and in a visual format they respond to. If you're wanting to highlight a few key metrics, you can even create a dashboard for them that visualises their performance on those key metrics. 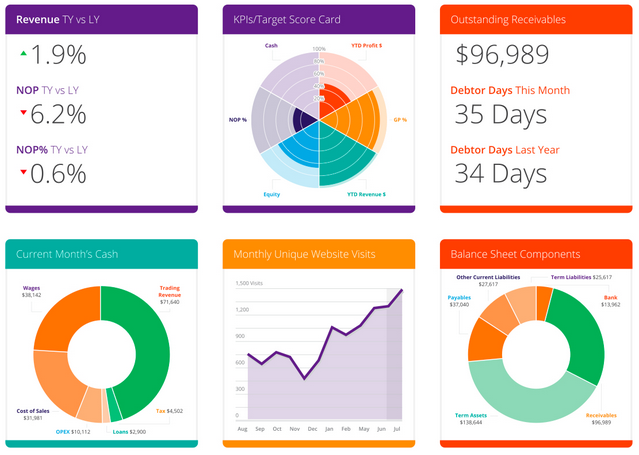 That way you can focus in on metrics for your client to work on. Through sourcing the right data for your clients, processing it and then analysing it you’re ensuring your client’s data is taking the correct journey and you are providing your client with value and insights for their business. Want to know more? Keep an eye out for our CEO Richard Francis’ Super VCFO blog series where he goes into these themes in depth from his expert experience.